Infant swimming is the phenomenon of human babies and toddlers reflexively moving themselves through water and changing their rate of respiration and heart rate in response to being submerged. The slowing of heart rate and breathing is called the bradycardic response. It is not true that babies are born with the ability to swim, though they have reflexes that make it look like they are. Babies are not old enough to hold their breath intentionally or strong enough to keep their head above water. Most infants, though not all, will reflexively hold their breath when submerged to protect their airway and are able to survive immersion in water for short periods of time. Infants can also be taken to swimming lessons. Although this may be done to reduce their risk of drowning, the effects on drowning risk are not reliable. It is extremely important to note that while babies can imitate swimming motions and reflexes, they are not yet physically capable of swimming. 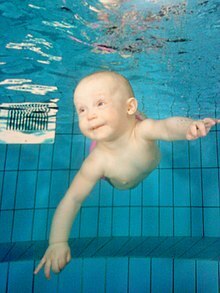 Most human babies demonstrate an innate swimming or diving reflex from birth until the age of approximately six months. However, babies this young cannot actually swim, due to their lack of body features and strength. Other mammals also demonstrate this phenomenon (see mammalian diving reflex). This reflex involves apnea (loss of drive to breathe), slowed heart rate (reflex bradycardia), and reduced blood circulation to the extremities such as fingers and toes (peripheral vasoconstriction). During the diving reflex, the infant's heart rate decreases by an average of 20%. The glottis is spontaneously sealed off and the water entering the upper respiratory tract is diverted down the esophagus into the stomach. The diving response has been shown to have an oxygen-conserving effect, both during movement and at rest. Oxygen is saved for the heart and the lungs, slowing the onset of serious hypoxic damage. The diving response can therefore be regarded as an important defence mechanism for the body. Drowning is a leading cause of unintentional injury and death worldwide, and the highest rates are among children. Overall, drowning is the leading cause of injury death among children aged 1–4 years in the United States, and is the second highest cause of death altogether in that age range, after congenital defects. A Centers for Disease Control and Prevention study in 2012 of United States data from 2005–2009 indicated that each year an average of 513 children aged 0–4 years were victims of fatal drowning and a further 3,057 of that age range were treated in U.S. hospital emergency departments for non-fatal drowning. Of all the age groups, children aged 0–4 years had the highest death rate and also non-fatal injury rate. In 2013, among children 1 to 4 years old who died from an unintentional injury, almost 30% died from drowning. These children most commonly drowned in swimming pools, often at their own homes. Traditionally, swimming lessons started at age four years or later, as children under four were not considered developmentally ready. However, swimming lessons for infants have become more common. The Australian Swimming Coaches and Teachers Association recommends that infants can start a formal program of swimming lessons at four months of age and many accredited swimming schools offer classes for very young children, especially towards the beginning of the swimming season in October. In the US, the YMCA and American Red Cross offer swim classes. A baby has to be able to hold his or her head up (usually at 3 to 4 months), to be ready for swimming lessons. Children can be taught, through a series of "prompts and procedures," to float on their backs to breathe, and then to flip over and swim toward a wall or other safe area. Children are essentially taught to swim, flip over and float, then flip over and swim again. Thus, the method is called "swim, float, swim." In a 2009 retrospective case-control study that involved significant potential sources of bias, participation in formal swimming lessons was associated with an 88% reduction in the risk of drowning in 1- to 4-year-old children, although the authors of the study found the conclusion imprecise. Another study showed that infant swimming lessons may improve motor skills, but the number of study subjects was too low to be conclusive. There may be a link between infant swimming and rhinovirus-induced wheezing illnesses. Others[who?] have indicated concerns that the lessons might be traumatic, that the parents will have a false sense of security and not supervise young children adequately around pools, or that the infant could experience hypothermia, suffer from water intoxication after swallowing water, or develop gastrointestinal or skin infections. In 2010, the American Academy of Pediatrics reversed its previous position in which it had disapproved of lessons before age 4, indicating that the evidence no longer supported an advisory against early swimming lessons. However, the AAP stated that it found the evidence at that time insufficient to support a recommendation that all 1- to 4-year-old children receive swimming lessons. The AAP further stated that in spite of the popularity of swimming lessons for infants under 12 months of age and anecdotal evidence of infants having saved themselves, no scientific study had clearly demonstrated the safety and efficacy of training programs for infants that young. The AAP indicated its position that the possible benefit of early swimming instruction must be weighed against the potential risks (e.g., hypothermia, hyponatremia, infectious illness, and lung damage from pool chemicals). The American Centers for Disease Control and Prevention recommends swimming lessons for children from 1–4, along with other precautionary measures to prevent drowning. The Canadian Pediatric Society takes a middle-of-the-road approach. While it does not advise against swimming lessons for infants and toddlers, it advises that they can not be considered a reliable prevention for drowning, and that lessons for children less than 4 years should focus on building confidence in the water and teaching parents and children water safety skills. They also recommend, for all children less than 4 years, constant arms-length supervision for toddlers and infants near any body of water (including bathtubs) and that infants be held at all times. ^ a b c Goksor, E.; Rosengren, L.; Wennergren, G. (2002). "Bradycardic response during submersion in infant swimming". Acta Paediatr. 91 (3): 307–312. doi:10.1111/j.1651-2227.2002.tb01720.x. PMID 12022304. ^ Pedroso, FS (February 2012). "The diving reflex in healthy infants in the first year of life". Journal of Child Neurology. 27 (2): 168–71. doi:10.1177/0883073811415269. ^ Hassal, IB (1989). "Thirty-six consecutive under 5 year old domestic swimming pool drownings". Australian Paediatric Journal. 25 (3): 143–6. doi:10.1111/j.1440-1754.1989.tb01438.x. ^ Winston, Robert (1998). "The Human Body". BBC. Retrieved 18 August 2014. ^ Alboni, Paolo; Alboni, Marco; Gianfranchi, Lorella (Feb 2011). "Diving bradycardia: a mechanism of defence against hypoxic damage". Journal of Cardiovascular Medicine. 12 (6): 422–427. doi:10.2459/jcm.0b013e328344bcdc. Retrieved 17 August 2014. ^ a b Percentage chart of the causes of death by unintentional injury, ages 1–4 (all races, both sexes), in 2013. Sample size: 1,316. Drowning: 29.9%, motor vehicle traffic accidents: 24.8%, suffocation: 12.2%, fire/burns: 9.8%, etc. National Center for Health Statistics (NCHS), National Vital Statistics System. ^ a b c Laosee, Orapin C.; Gilchrist, Julie; Rudd, Rose (May 18, 2012). "Drowning - United States, 2005-2009". Center for Disease Control: Morbidity and Mortality Weekly Report. 61 (19): 344–347. Retrieved 18 August 2014. ^ a b c "Unintentional Drowning: Get the Facts". Centers for Disease Control and Prevention, National Center for Injury Prevention and Control, Division of Unintentional Injury Prevention. Retrieved 18 August 2014. ^ "Swim Australia FAQs". Retrieved 21 September 2014. ^ "Parent/Child Swim Lessons (Ages 6-36 months)". New York's YMCA. Retrieved 18 August 2014. ^ "Swimming Classes and Water Safety". American Red Cross. Retrieved 18 August 2014. ^ Pratt, Sarah. "Infant Swimming Classes". Parenting. Retrieved 18 August 2014. ^ Chief Judge Babcock (April 16, 2001). "Findings of Fact: Harvey Barnett, Inc. v. Shidler". Court LIstener. 143 F. Supp. 2d: 1247. Archived from the original on 18 August 2014. Retrieved 18 August 2014. ^ Court of Appeals for the Tenth Circuit (Aug 15, 2006). "Harvey Barnett, Inc. v. Shidler". Court Listener. Archived from the original on 18 August 2014. Retrieved 18 August 2014. ^ Brenner, RA; Taneja, GS; Haynie, DL; Trumble, AC; Qian, C; Klinger, RM; Klebanoff, MA (Mar 2009). "Association between swimming lessons and drowning in childhood: a case-control study". Archives of Pediatrics & Adolescent Medicine. 163 (3): 203–10. doi:10.1001/archpediatrics.2008.563. PMC 4151293. PMID 19255386. ^ Moreno, MA; Furtner, F; Rivara, FP (Mar 2009). "Water safety and swimming lessons for children". Archives of Pediatrics & Adolescent Medicine. 163 (3): 288. doi:10.1001/archpediatrics.2008.572. PMID 19255402. ^ Dias, JA; Manoel Ede, J; Dias, RB; Okazaki, VH (Dec 2013). "Pilot study on infant swimming classes and early motor development". Perceptual and Motor Skills. 117 (3): 950–5. doi:10.2466/10.25.PMS.117x30z2. PMID 24665810. ^ Schuez-Havupalo, L; Karppinen, S; Toivonen, L; Kaljonen, A; Jartti, T; Waris, M; Peltola, V (Jul 7, 2014). "Association between infant swimming and rhinovirus-induced wheezing". Acta Paediatrica. 103: 1153–1158. doi:10.1111/apa.12736. PMID 25041066. ^ Weeks, Carly (July 13, 2009). "Water Safety: Can a six-month-old save himself from drowning?". The Globe and Mail. Retrieved 18 August 2014. ^ "US babies learn 'self-rescue' from drowning". France-Presse. July 23, 2011. Retrieved 18 August 2014. ^ "Drowning Happens Quickly– Learn How to Reduce Your Risk". Centers for Disease Control and Prevention. Retrieved 18 August 2014. ^ Hong Nguyen, B (2003). "Swimming lessons for infants and toddlers". Paediatrics and Child Health. 8 (2): 113–4.